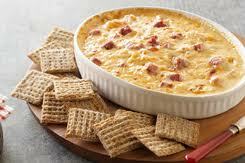 If you like Reuben sandwiches you will love this dip! I love a warm dip in the cold months, this one fits the bill. Mix all of your ingredients and spread into a shallow baking dish or a pie plate. Looks delicious! really creamy! I would like to make some of those for my daughter! Thanks for sharing such a delightful spread!